We have many misconceptions about Martin Luther, the religious founder whose 95 theses about the Catholic Church, posted on October 31, 1517, launched the Reformation. Luther was, in fact, an influential Catholic — the second ranking member of the Augustinian order, overseeing 10 monasteries and two universities served by the order. He didn’t rail against the corrupt monasteries — he helped build good ones. But, bit by bit, Luther repositioned himself as an adversary of the Church. It’s an important cautionary tale, because the steps he took on his road to radicalism are much more available now than they were 500 years ago. 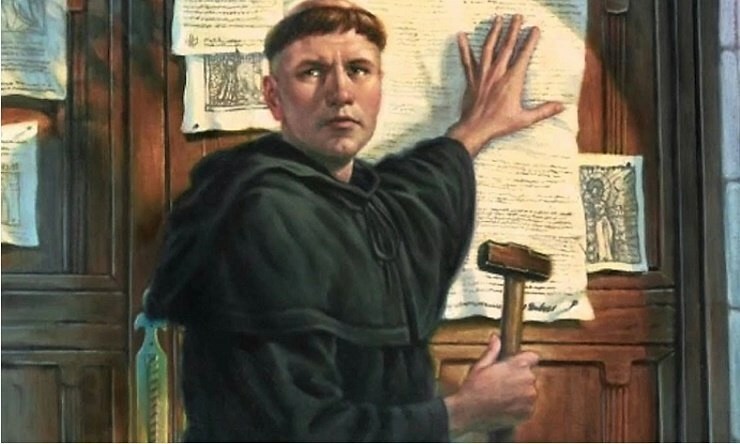 We misunderstand what it meant for Martin Luther to nail his 95 theses to the doors of a Wittenberg church door. This was not a bold, unique act of protest. Posting on Church doors was the common way to disseminate information. It was done all the time. It was expected in academic circles. What happened with Luther’s theses is that others took them, translated them to common language from Luther’s Latin, and published them all the way from Amsterdam to Beren in Switzerland. In other words, they went viral. And it was others’ use of his words, not his own, that made him a sensation. This is exactly what happens when we post on the “church doors” of our time — social media. The argument we make in one context is now available for others to use out of context. Our words take on a life of their own. When he posted his theses, Luther didn’t want to break from the Catholic Church. He wanted to purify the Catholic Church, as Brad S. Gregory points out in his Great Course on the subject. Luther argued that indulgences should be attached to good works and confession — not donations — and he was right. Indulgences today require confession and penance. But Luther’s zeal for a pure Church got out of hand. Significantly, at the Leipzig Disputation in 1519, Luther debated with Johann Eck, a renowned scholar who pushed Luther to say things he had not previously said, taking his beliefs to their logical conclusion. The same thing happens in today’s contentious internet debates, in which we make claims we never would have made otherwise. Third: The more Luther began to play to the crowd, the more he lacked modesty in his argument. After Eck, Luther kept going. He wrote treatises expanding on the new, extreme versions of his arguments, painting the Church as an obstacle to a scriptural encounter with Christ and arguing that there should only be, at most, three sacraments. He went even further in his preaching. “He wanted to move people, to appeal to the heart as well as to the head,” as Gregory put it. But in order to do that, he spoke in earthy, coarse language, becoming, the “original cussing preacher” — an insult comic. But above all, he lacked — as Erasmus put it — modestia. Great theologians have great intellectual modesty about their divine subject matter. In his Summa Contra Gentiles, Thomas Aquinas protested his own “limited powers” and he spent much of his Summa Theologica explaining how little he could ever hope to say about his subject. But the clickbait culture of the internet militates against intellectual modesty. Bold, brash statements get attention. Nuance gets ignored. Fourth, the Reformation initially grew by memes and song parodies, not argumentation. To the Reformers’ credit, we owe widespread literacy to their emphasis on the Scriptures. But before widespread literacy, the early Protestant movement used cruder means. Early reformers circulated woodcut illustrations that caricatured the Church, often scatologically, along with broadsheet polemics designed to be read aloud, and ballads that replaced the lyrics of popular songs with new, anti-establishment lyrics. We may have a pure, clear vision of what the Church can and should be. We may start out arguing our point vigorously, to shine a light in the dark. But our single-minded vision can easily lose perspective and our light can quickly become heat. And you never know when your simple post will get out of hand.